Germany's Chancellor Angela Merkel reacted quickly to nationwide antinuclear protests reignited by the still out-of-control radiation disaster at Fukushima, Japan. 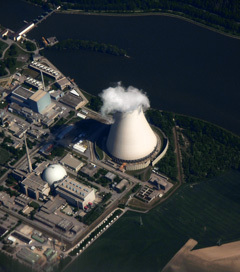 The chancellor first ordered the powering down of the seven oldest and most dangerous reactors in Germany and she halted plans for any new reactor construction. Disappointed by partial shutdowns, the Greens, the Social Democrats, and thousands of others relentlessly organized protests and rallies involving tens of thousands. German voters then marched to the polls in high numbers and proceeded to give Merkel's right-wing Christian Democrats a shellacking in two major state elections. On March 27, in the wealthy state of Baden-Wüerttemberg, Merkel's conservative party suffered huge losses in what became a referendum on nuclear power. And in Bremen's state elections in May, the Greens won 22.5 percent of the vote, up from 16 percent in 2007, and pushed Merkel's Christian Democrats out of power for the first time in 58 years. The chancellor then shocked the heads of giant utility corporations and industrialized governments all over the world by declaring that Germany would completely phase-out nuclear power. Two days earlier, over 160,000 marchers filled the streets of 20 German cities calling for the immediate shutdown of all 17 of the country's reactors. Even small utility companies, known collectively as the Mittelstand, have endorsed the complete phase-out of nuclear power. Merkel's “Atomkraft? Nein, Danka!” transformation was a dramatic reversal of her pro-nuclear conservative government's attempted repeal of an earlier reactor phase-out statute – passed back in 2000 – and a renunciation of her government's earlier plan to extend the operating licenses of operating reactors. Still unsatisfied and alarmed by the increasingly dire news from Fukushima, the Greens charge that Merkel's gradualism is needlessly slow, dangerous and beholden to the interests of reactor owners. Broad coalitions are planning rallies, marches, camps and teach-ins throughout the summer and fall pushing for immediate, across-the-board shutdowns. Analysts say it could be accomplished now without harming industry or living standards, if accompanied with urgent conservation programs and enforceable efficiency measures. A wide range of ecology-conscious political, educational, labor, environmental and human rights groups have turned German public opinion vigorously antinuclear. Among other reasons for being sick of nuclear power, Germans point to: 1) dangerous levels of radioactive fallout that still contaminate Germany from the 1986 Chernobyl disaster, and 2) two authoritative federal government reports that found childhood leukemia rates increased among kids the closer they lived to operating reactors. Unhappy reactor owners claim that Merkel's reversals will increase the cost of electricity and cost jobs. Independent analysts and nuclear-free utilities like the Mittelstand energy collective claim otherwise, saying the reactors' phase-out will create many more jobs – in renewable industries and in innovative efficiency programs – and help eliminate pollution. Broad-based antinuclear opinion has also forced Merkel to announce an increase in the construction of wind farms and investments in energy-efficiency programs and renewables in order to eliminate reliance on the aged reactors. One estimate of the cost of the transformation is $11.3 billion. Bills to overhaul energy policy will come before Parliament this month. Even Merkel's go-slow approach, using “incentivized” development alternatives over the next ten years, will replace the 22 percent of Germany's electricity now provided by nuclear reactors. Germany is already a world leader in the safe energy industry, producing 17 percent of its electricity from renewables, and by 2020, renewable generation should reach 40 percent.